Dress forms, a clothing rack, a large basin with wash board and soap, a pile of fabric, a work table. And off stage left, a chair. Old Frosya enters, the ghosts of her former co-workers standing on the catwalk on the upper level of the stage. And so the stage is set for the Seam Collective’s production of Polly Phokeev’s Seams, directed by Mikaela Davies – running at the Theatre Passe Muraille (TPM) Mainspace as part of SummerWorks. 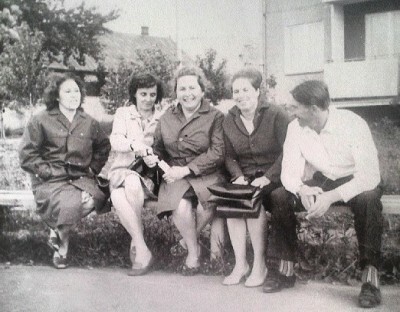 Inspired by an old photo of Phokeev’s grandmother and her seamstress/seamster co-workers, Seams is set in the wardrobe room of a theatre in Moscow, 1939. Old Frosya (Clare Coulter) is the sole survivor of a group of costume-makers – and her memories turn to their moments together in 1939, in the first months of WWII. In a world where the state owns everything, corruption runs wild, and being broke, cold and hungry is commonplace, it’s everyone for themselves. People are desperate enough to report neighbours, friends and co-workers for any hint of suspicious activity – selling out one family for another to heavy-handed authorities – in order to survive or, in some cases, to get perks like a nicer apartment. Suspicion and mistrust, and guarded thoughts, become a way of life. The love/hate for Russia and the people in their lives is palpable. Everyone has a secret. And this is everyday life. Part memoir, part confessional, Frosya’s narrative starts with relatively happy times – a workplace family gossiping about the actors and selectively sharing their lives. It’s a microcosm of the larger world outside the wardrobe room; and as conditions deteriorate in Russia – in an already difficult socio-political environment – so too do they begin to crumble in their world. Seams features moving, nuanced performances from the entire cast. Coulter is haunting as the gruffly matter of fact, wry-witted Old Frosya. As Frosya’s younger self, Caitlin Robson brings a bright warmth and generosity to the brisk and efficient costume room den mother. Ewa Wolniczek brings a strong, stubborn sense of drive and idealism to the passionate young activist Marina. There’s great chemistry between Krystina Bojanowski (the positive, open-hearted and hopeful Ira) and Jesse La Vercombe (the quiet, pleasant and troubled Anton) – who share some adorably awkward moments as both fumble around their attraction for each other. And there’s an equally lovely dynamic between Sochi Fried’s dark, introspective and mysterious Radya and Elizabeth Stuart-Morris’s irreverent, daring and carefree Shura – their moments together full of aching longing and electric eroticism. Of course, circumstances being what they are, when they are, the good times cannot last – and with the ransacking of the wardrobe in a theatre already on the brink of closure, so too are relationships torn apart as their time together draws to a close. With shouts to design team Shannon Lea Doyle (design), Steve Vargo (lighting), Jackie McClelland (installation) and Nicholas Potter (sound) for their evocative construction of this world. Seams is a beautiful, bittersweet memory play – equal parts charming and heartbreaking – featuring outstanding, powerful performances. Seams has two more performances at the TPM Mainspace: Fri, Aug 14 at 9:30 p.m. and Sun, Aug 16 at 4:15 p.m.The buzz is strong with this show, so book in advance or get to the venue box office early. In the meantime, check out Bailey Green’s chat with Phokeev, Davies and Stuart-Morris (who does double duty as producer) for In the Greenroom. 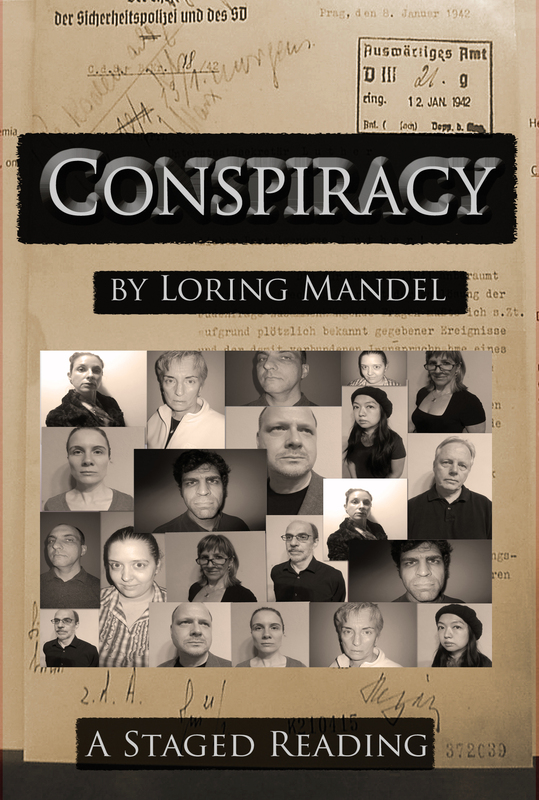 I went to see Heretofore Productions’ marvelous staged reading of Loring Mandel’s Conspiracy at Grace Church on-the-Hill (300 Lonsdale Road) last night, the first of a two-night run. Co-produced by Leeman Kessler and Danielle Capretti, and co-directed by Capretti and Vivian Hisey, this is an adaptation of Mandel’s film Conspiracy, a documentary-like look at the 1942 Wannsee Conference, where a group of high-ranking Nazi officials decide on the details of their Final Solution. With the audience set up around the conference table, we literally get a fly-on-the-wall look at the proceedings – made all the more chilling by how ordinary the meeting looks on the surface as we witness the disturbing discussion about the fate of 11 million people. The use of a mixed cast, with female actors playing some of the parts, drives home the humanity of the people attending this meeting – however unthinkable the subject. Seeing these characters in modern-day corporate costuming (co-director/actor Danielle Capretti pointed out during the talkback that red costume highlights, such as a handkerchief, denoted SS officials), one gets the feeling that one could be observing any corporate or government boardroom meeting; despite the horrible topic at hand, the conference is very much about business. Here, we see madness and power enacted under a thin veil of rationality, practicality and legal reasoning – but it’s important to not demonize these people. Viewing these men as monsters distances them from ourselves in such a way as to deny that this kind of meeting could happen anytime, anywhere. They could be anyone. The Catholic and Lutheran churches would turn a blind eye, and the Nazis had already seen ample evidence of international rejection of Jewish refugees. The sense that there is plenty of culpability to go around provides an easy rationale for the Nazis’ undertaking. Language is sharpened to a polite point, its lethal intent civilized by euphemism. “The Jewish question” or “problem.” “Evacuate.” “Process.” Legal terminology is used to define and debate who is a Jew and who is German. Statistics on mortality by various means are casually noted – and mined for the most efficient and expedient methodology, with a nod to the Americans for their “ingenious” assembly line innovation. And, with the iron grip of the SS in charge of the discussion, it gradually dawns on you that the conference is a mere formality – all has been decided and all that is required from attendees is obedience. Each actor does an excellent job of finding the humanity in his/her character – again, it’s important to not view these men as demons, but as people. Ordinary people doing abhorrent things. Otherwise, we learn nothing. Political and power play infighting abound. While Stuckart (the architect of the Nuremburg Laws) is more concerned with the legal implications of their decision and nervous bureaucrat Neumann is worried about workforce issues, Kritzinger (the only one to express remorse in the end) is the only one who seems to have a modicum of conscience; and both Stuckart and Kritzinger are bullied by Heydrich to acquiesce to the plan. And we have Luther to thank for what we know of this meeting. Against orders, he kept his transcript and it was found in the aftermath of the war. Allen Kaeja of Kaeja d’Dance, the son of an Auschwitz survivor who has choreographed several pieces about the Holocaust, hosted the post-reading talk-back, and shared the moving and incredible story of his dad’s experience and how he escaped. During the talkback, the point about the importance of the characters being portrayed as human came up several times. No one is immune to being in a position to make horrific decisions, particularly in a culture of fear, in this case presided over by Heydrich and the SS, who were not above bullying or threatening other officials, and willing to do the killing that average soldiers lacked the stomach for (a morale problem pointed out by Lange during the meeting). The matter of fact, almost casual tone of this terrible conference discussion is made all the more tragic by how human these men are, highlighted by Hofmann becoming momentarily ill and Kritzinger being visibly sick at heart at the end of the meeting. The issue of intent also came up – an audience member mentioned that the actions of this group of men went beyond discrimination, but to selling their souls for power. Actor Janice Hansen called to mind the classic psychology experiment in which subjects were instructed to administer electric shocks to an unseen person, who they could hear reacting in pain. Subjects who continued to give the shocks weren’t evil, they just weren’t able to disobey or say no. We need to believe that ordinary people can do terrible things. Heretofore Productions’ Conspiracy is a chilling look at mad atrocity planned with rational boardroom expediency and legal debate. You have one more chance to catch this very brief run of this excellent staged reading: tonight (Fri, Nov 21) at 7 p.m. Admission is free and there will be another post-performance talkback tonight. Department of Corrections: An earlier version of this post included incomplete/incorrect information on the producing and directing teams; this has since been corrected.